I have students telling me all the time about the latest and "greatest" health products that they see on television, and how such products are miracle workers or quick fixes for health problems. I will then tell students to ask questions about the product, especially if claims seem too good to be true...Who is selling the product? What are their qualifications? Have there been any complaints about the product? Has it been proven to actually work? 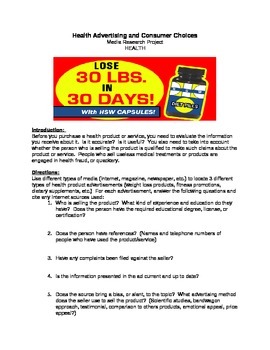 This research activity allows students to evaluate various health products and advertisements, and determine whether the information they are receiving about the product is credible or not. Students will also examine the credentials of the person selling the product and if they are engaged in any type of health fraud or quackery.